Listen to a Foothill Church sermon. Foothill Church first began in the 1930’s, under Reverend James Walls. Since then multiple pastors have contributed to the growth and history of this church, including, Ed Anderson, Bob Peters, Marcus Gaston, Gerald Fry (who started Foothill Christian School in 1964), Curtis Mettline, Wayne Fagerstrom, Mark Hinman and Bill Dogterom, who pastored the church for 27 years. In November 2006, the baton was picked up by our Lead Pastor, Chris Lewis. 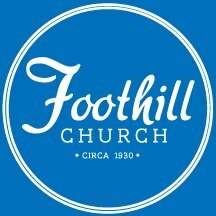 Under his leadership, the church adopted a new name: Foothill Church. We are a group of diverse people (ethnically, socioeconomically, politically, geographically) gathered for the common purpose of glorifying God and making much of Jesus in our community. In November 2007, we moved our services from the Foothill Christian School gymnasium on Baseline to the sanctuary at Grand Avenue. Since 2006, the church has maintained an annual growth of over 25%. God is moving at Foothill Church. Come join us.